The Midwest is known to have some brutal cold winters, and one of the last things you will want to do when the temperatures drop and the snow starts falling is clean or fix your garage door. That’s why the fall is a great time to finish up any remaining preventive maintenance so you’re not stuck with a faulty garage door system in the winter. 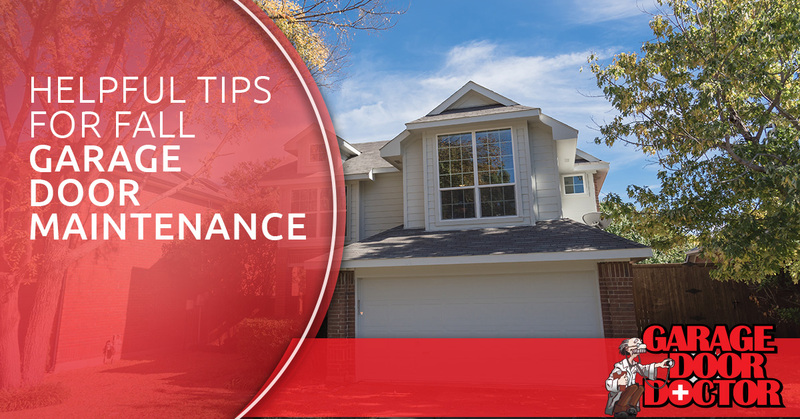 Luckily, we put together four fall garage door maintenance tips to ensure be worry-free as Old Man Winter approaches. While there is still some sunshine and temperatures are still up in the fifties, make sure to give your garage a good exterior and interior cleaning. Wash the garage floor with soap and water to get rid of any fluids, dirt and debris from the road, or stains that may be building up. Extra Tip: Make sure that the lenses of your garage door photo eye sensors are clear, free of any dirt, dust, and debris. As intricate systems of metal moving parts, garage doors need lubrication to work smoothly. The owner’s manual of garage door system should contain detailed lubrication information. Make sure that the tracks and rollers operate without any issues. Ensure that the torsion spring above the door is well lubricated. Spray all moving parts with a lubricant to help create a quiet, reliable operation. The corners, bottom, and sides of your garage door are most likely to let cold air in during the winter, causing your heating bills to spike when left unattended. Double check to ensure that your weather stripping and seals are in-tack, not worn out, and show no signs of weathering or cracking. Consider adding or replacing insulation to your garage door if it’s not already insulated — some new garage doors even come insulated. It is common for garage door tracks to be damaged over time, especially after repetitive use. Before the winter season, do your due diligence to make sure that the track is in good condition. Thoroughly inspect the track in search of nicks, dents, and other damages. Ensure that the rack is clear and that the door is running smoothly along the rails as it should. The tips above are just a few ways to ensure your garage door is ready for the upcoming weather, however, you cannot go wrong with professional maintenance from the experts at Garage Door Doctor. Contact us to learn more.